Former House Speaker Paul Ryan wants “to be clear” about a statement he made earlier this week that suggested Democrats could defeat President Donald Trump in 2020. Ryan originally created a stir when he suggested Monday that President Donald Trump could lose the 2020 presidential election if the race focuses on Trump’s personality. Ryan was in Vero Beach, Florida, participating in a lecture series when he also said he believes there are some Democrats who could win the 2020 presidential election, TCPalm reported. 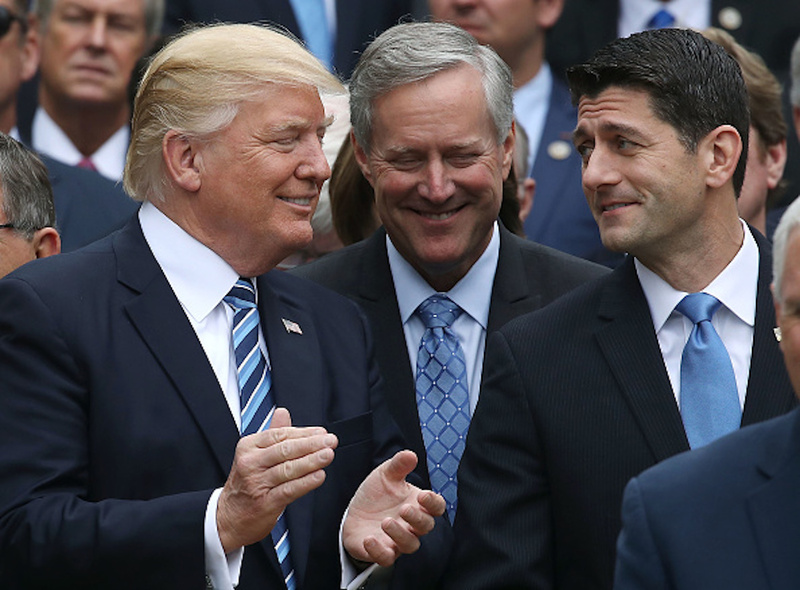 President Donald Trump (L), stands with then-House Speaker Paul Ryan (R-WI) (R) and Freedom Caucus Chairman Mark Meadows (R-NC), after Republicans passed legislation aimed at repealing and replacing ObamaCare, during an event in the Rose Garden at the White House, on May 4, 2017 in Washington, DC. Ryan was pointedly critical of Trump during the 2016 primaries and did not support his candidacy. After Trump won the GOP nomination, Ryan seemed less than enthusiastic but, more or less, advanced the president’s policies in the House of Representatives where the Republicans enjoyed a majority at the time. In January, during the partial government shutdown, Trump blamed Ryan for not securing funding for a border wall when he had the opportunity to do so, according to one report.